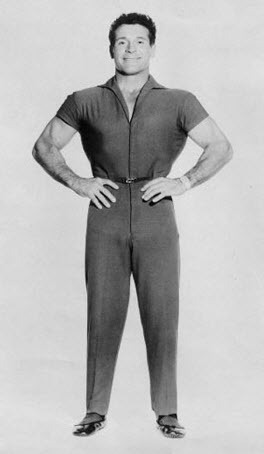 It was a sad week last week when I learnt that one of my all time health and fitness heroes, Jack Lalanne, passed away at the ripe old age of 96.Even at that age most who knew him thought it was well before his time – I was pretty sure he could live to 200! To date, he had the longest running TV health show ever – airing from 1959 to 1985 on ABC. 1956 Age 42: Set a world record of 1,033 pushups in 23 minutes on “You Asked for It” – a TV Show with Art Baker. 1984 Age 70! : Handcuffed, shackled and fighting strong winds and currents, towed 70 boats with 70 people from the Queen’s Way Bridge in the Long Beach Harbor to the Queen Mary, 1 ½ miles. He had a superb way of giving it to you straight, in a highly inspirational and motivational way. “It’s time to leave you. Goodbye Jack. We will all miss your inspiration, your character and your passion.